They called themselves the fountain people, although what this signified the young man didn't know. Perhaps they were a race of water-worshippers, beholden to a deity that caused rivers to flow forth from crusty rock. Whatever their origin, to the ambitious archeologist of 7012 they were a rare find. Their story would make his career. Ha, ha, indeed they would! The truth would be less fascinating. I like this ponder! where is that plate ? We lose so much, even in 50 years. I wonder what "people" would be like that far in the future. 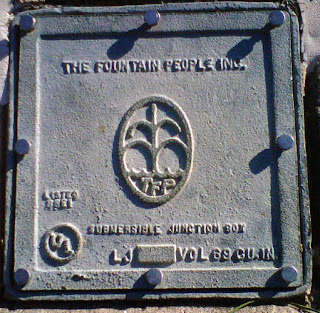 I like the idea of Fountain people, though. Would love to be one. @izzy: This is near one of the man-made waterfalls at Helen's Park in Houston. Thats why I'm gonna be cremated. I don't want anyone "discovering" me in the next millenia. Capitalism at work? Will he be able to relate so far into the future?